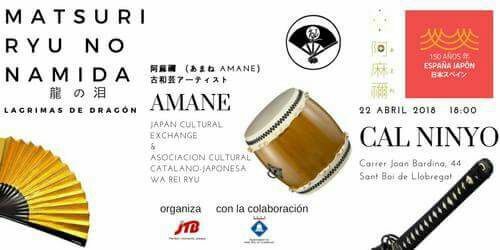 Organised by JTB Perfect moments, always, is a Matsuri that will take place on Sunday 22nd April that features a performance by AMANE of ‘Lagrimas de Dragón’ where the principal themes include the return of nature and creativity for the future. Throughout the performance, a variety of Japanese music and art forms have been combined, using traditional instruments such as the Sharmisen and Wadaiko. Moreover, this event sees the special participation of the Catalonian-Japanese Cultural Association of WA REI RYÛ, which will put on an excellent demonstration of the most known katas. This event has been organised to commemorate the 150th anniversary of bilateral relations between Spain and Japan. One of the main acts is a theatrical drama based on a Japanese myth about dragons, which together with the legend of Sant Jordi de Cataluña, fuses perfectly Japanese and Mediterranean culture – the basis of the Mediterranean Samurai concept.